As the violence in northeast Nigeria continues into its ninth year, communities have been mobilizing to augment Nigerian military responses. These groups, known as the yan gora (Civilian Joint Task Force – CJTF), yan banga (vigilantes) and kungiyar maharba (hunters) have played important roles in protecting communities and pushing back against opposition groups. In the course of these activities, these groups have also caused civilian harm. 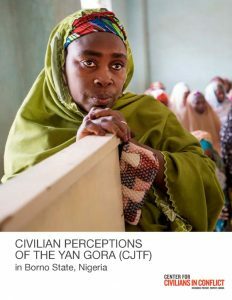 To better understand civilian perspectives around the dynamics associated with the yan gora in Maiduguri and explore potential areas to mitigate civilian harm and advance civilian protection, CIVIC conducted research in Borno State in December 2017. Civilian perspectives offer a number of areas where the yan gora have been helpful in civilian harm mitigation and protection as well as areas where members of the group have themselves committed harm.